The Conference on Reversible Computation will bring together researchers from computer science, mathematics, engineering, and physics to discuss new developments and directions for future research in the emerging area of Reversible Computation. This particularly includes applications of reversibility in quantum computation. Research papers, tutorials, tool demonstrations, and work-in-progress reports are within the scope of the conference. 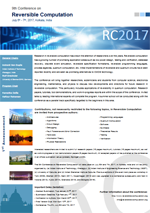 The 8th Conference on Reversible Computation will take place on July 7th and 8th, 2016 in Bologna, Italy and is organized by the University of Bologna, Italy. The proccedings are available at this page.